The nine remaining players at the Foxwoods Mega Stack Challenge are now on a quick break. When play returns, the blinds will be increased 25,000-50,000 with a 5,000 ante. The average chip stack is now 1,730,000. Webb made top pair but Courtney flopped a set of jacks. The turn was the [8c] and the river came the [9s]. David Webb was eliminated in 10th place for $6,803. With only 11 players remaining, the average chip stack is now 1,418,000. Adam Hui raised to 65,000 before the flop and was called by Mark Sykes and Ramy Ibrahim. The flop came down [Jd][Td][9s] and Hui fired 110,000. Sykes folded but Ibrahim made the call. Hui had flopped two pair but was behind Ibrahim's flopped straight. When a nine hit on the river, Ibrahim looked as if he had lost the tournament and Hui clearly was excited to make his full house. However, what neither one of them noticed at first was that it wasn't just any nine that fell on the river, it was the [9d], giving Ibrahim a straight flush to king and sending Hui to the rail in 15th place. Despite have just around 400,000 a short time ago, Eric Siegel has found himself a bit of a heater and now sits as one of the top chips stacks with around 2,000,000. The players in the Foxwoods Mega Stack Main Event are now on a 10-minute break. With 17 players remaining, the average chip stack is now 918,000. Rob Brown was just eliminated by Mark Sykes while another players was eliminated on the same hand at a different table. We are now down to 17 and players are redrawing for seats at the final two tables. After the player in the seven seat raised to 55,000 before the flop, Rob Brown reraised to 168,000. Seat Seven thought for a bit and then made the call. The flop came [8c][8d][7d] and Brown fired out 180,000. The seven seat then moved all in for an additional 541,000. Brown talked through the hand to try and get information out of his opponent. Finally, he announce call and showed [Ad][Qd] for two overs and the nut flush draw. Much to his surprise, his opponent flipped up [9h][8h] for trip eights. The turn was the [5h] and the river came the [7c], giving the seven seat a full house and the biggest pot of the tournament. Rob Brown was left with under 400,000 in chips after the hand. With 22 players remaining, the average chip stack is now 709,000. Rob Brown has been active since being back from dinner break and has managed to build his stack to over 1,300,000 with 23 players still remaining. Cards are back in the air after dinner break and the blinds are now 10,000-20,000 with a 3,000 ante. With 27 player remaining, the average chip stack is 578,000. The 27 remaining players are now on a one-hour dinner break. James Woods moved all in on the last hand before dinner break with [7h][7s] and was called by Rob Brown holding [Kc][Qd]. The board ran out 10-9-X-X-J to give Brown the straight and the pot. The incredible run of James Woods comes to an end but he finished in 28th place for $3,133. A short stacked Mike Sica was all in before the flop and called by both Adam Hui and Paul Darden. The board came [As][8d][8h][6d][Jd] before Hui bet 170,000 on the river. Darden folded and Hui turned up 8-7 for trips and Darden mucked. Sica turned up a pair of fives and was eliminated from the Foxwoods Mega Stack Main Event. With 38 players remaining, the average chip stack is just under 411,000. We are now down to the final 40 players in the Foxwoods Mega Stack Challenge and all players are guaranteed at least $2,803. Ramy Ibrahim has taken a commanding chip lead in the Foxwoods Mega Stack Challenge Main Event. With 43 players remaining, Ibrahim already sits on over 1,400,000 in chips, nearly what the average will be at the final table. 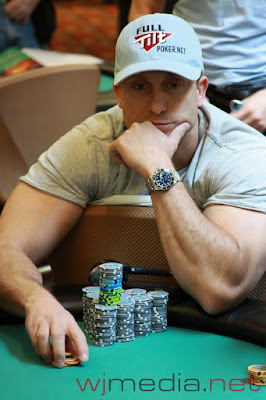 Mark Epstein has been eliminated in 44th place when his pocket jacks failed to catch up to his opponent's pocket aces. When they return, the blinds will be increased to 6,00-12,000 with a 2,000 ante. With 44 players remaining, the average chip stack is now 355,000. The top 40 spots will finish in the money. Paul Snead was eliminated from the Foxwoods Mega Stack Challenge Main Event in the biggest pot of the tournament when his pocket jacks failed to hold up against Ramy Ibrahim's [Ah][Kh] when a king fell on the flop. James Woods lost a monster pot with [As][5c] vs.[Td][Th] that he thought eliminated him from the tournament. Instead, it left him with three 1,000 chips. With antes at 1,000, he folded the next hand. The next hand he threw in his ante and was left with one orange and, after Mike Sica raised to 20,000, he tossed it in. Sica had [Ac][Jc] to Woods' [As][8c]. The board came [7s][5d][4d][3s][8h] and Woods nailed the river to stay alive. Now with 13,000, he moved all in with [Ah][5s] and was called by an opponent holding [Ac][As]. This time, the board ran out [7c][2s][4c][5h][3d] and Woods managed a huge chop. The next hand he was all in again with [Kd][2d] vs. [2h][2s] and managed to hit a king on the flop despite the fact that another player stated that they folded a king. After a big raise from Adam Hui, Woods moved all in again with [Kd][Qh]. Hui made the call and turned up [Qd][Qs]. Yet again, James Woods hit a king on the flop to stay alive. From a single 1,000 chip, the legendary James Woods now sits on over 140,000. After two players limped in, Matt Kleckner moved all in for 164,000 before the flop with pocket tens. He got one caller in the for of A-Q. Kleckner was ahead but his opponent drilled an ace on the flop to eliminate him from the tournament. With 60 players remaining, the average stack is now 260,000. The board ran out [Kc][Ks][8h][Kh][4d] and the dealer had to do a count to see who had more chips. In the end, veeRob was slightly outchipped by his opponent and eliminated from the Foxwoods Mega Stack Main Event. With 79 players remaining, the average stack is now just over 197,000. Adam Hui started Day 2 with 180,200 in chips but has been on an incredible heater over the first two hours of play today. He just lost his first pot of the day, a very small all-in race to an opponent, but still sits on over 400,000 in chips. We are down to the final nine tables in the Foxwoods Mega Stack Challenge Main Event. With 81 players remaining, the average chip stack is now 192,500. The players are now on the first break of the day. Tournament officials are currently coloring up the 100 chips. When play resumes, the blinds will be increased 2,500-5,000 with a 500 ante. Our Cabot Extra Sharp Player of the Day was Mike Dentale. Mike was knocked down to just 4,000 in chips late on Day 1 but built his stack back up and made it through to Day 2 with 90,100 in chips. Mike will take home the Cabot Extra Sharp Player of Day shirt and hat as well as a month's supply of Cabot Cheese. Legendary actor James Woods has just been moved into the eight seat at the Mega Stack Challenge Main Event Live Stream Feature Table. Just click "Watch LIVE Video" to view the feed. Day 2 of the Mega Stack Main Event Underway! Cards are in the air for our final 102 players in the Foxwoods Mega Stack Challenge Main Event. The blinds are now 2,000-4,000 with a 400 ante. The average chip stack is just under 153,000. Click "Watch LIVE Video" at the top of the page to view the live feed. Paul Darden, Mike "Little Man" Sica & Rob "veeRob" Perelman at Live Stream Table! Just click "Watch LIVE Video" at the top of the page to view the live stream feed of our feature table. Day 2 of the $1,200 Foxwoods Mega Stack Challenge is set to begin in about 15 minutes. Be sure to follow FoxwoodsLive.com for all of the updates from the event. The live stream will be up and running in just a few minutes. Just click "Watch LIVE Video" to view the feed. Play has come to an end on Day 1 of the Foxwoods Mega Stack Challenge Main Event. Players are currently bagging their chips and play will resume at 11am. It appears that there are just over 100 players remaining. The chip counts and Day 2 seating assignments will be posted as soon as they become available. The clock has been stopped and it has been announced that there will be six more hands played at each table and then play will conclude for the night. Mike Dentale lost a monster pot of over 150,000 chips and was left with nothing but four 1,000 chips. However, he tripled up on the next hand and has since managed to build his stack back up to a very respectable 80,000. The players are now on their final 10-minute break of the day. With 120 players remaining, the average chip stack is now 130,000. On our most recent pass through the poker room, it appears as if Paul Snead has passed the 300,000 mark in chips. With 140 players remaining, the average chip stack is now just over 111,000.